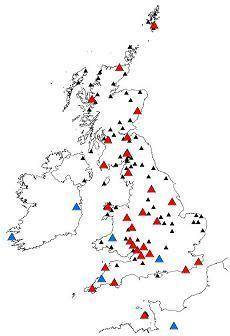 We operate a network of over 100 seismograph stations across the UK. Continuous data from nearly all stations is transmitted directly to our office in Edinburgh for real-time processing and analysis. 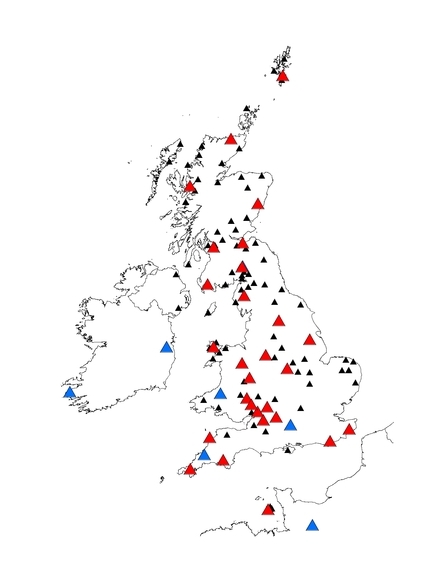 In an average year we detect about 100 earthquakes around Britain. About 20% of these are felt by people. The network should detect all events with magnitudes of 2.0 or above in mainland Britain. We also detect hundreds of earthquakes from all around the world. Monitoring helps us understand the level of earthquake risk in UK and to design accordingly. We can also use earthquakes to image the Earth under our feet. Even small earthquakes generate lots of interest, so there is a need for accurate information to allay concerns. UK Seismograph Network. Click for a larger version. Above: Seismogram from the Dumfries Earthquake, 13 May 2001, 08:26 UTC, 2.9 ML.